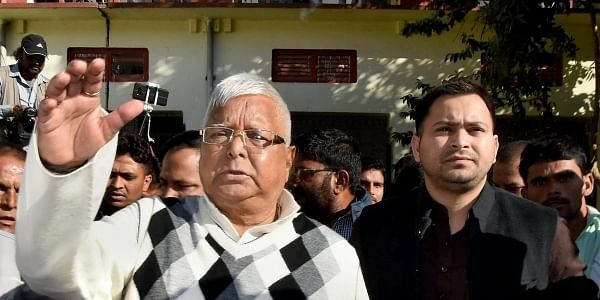 RJD chief Lalu Prasad on Saturday attacked the BJP over his conviction in a fodder scam case, accusing the party of playing "dirty politics" to get votes by tarnishing the image of its opponents. RANCHI: RJD chief Lalu Prasad Yadav on Saturday attacked the BJP over his conviction in a fodder scam case, accusing the party of playing "dirty politics" to get votes by tarnishing the image of its opponents. Lalu Prasad said he would keep on fighting for social causes till his last breath. "To hide its failures, false rhetoric and to get votes, the BJP uses every dirty immoral trick in politics to change the public perception of its opponents," Lalu Prasad said in a series of tweets. "Powerful people and powerful classes have always managed to divide society into ruling and the ruled classes. And whenever anyone from the lower hierarchy challenged this unjust order, they would be deliberately punished," the Rashtriya Janata Dal (RJD) leader said referring to his caste. The former Bihar Chief Minister's remarks came soon after a special Central Bureau of Investigation (CBI) court convicted him in a fodder scam case. After the verdict, he was immediately taken into custody and taken to Birsamunda Jail in Ranchi. The quantum of punishment will be announced on January 3. The case relates to fraudulent withdrawal of Rs 84.5 lakh from Deoghar district treasury between 1991-94. The RJD supremo said the BJP was "propagating false rhetoric" and warned them that he was not alone in this war. "Bihar stands with me," he said. He said that he can be troubled "but cannot be defeated". "We have to move on the path of victory," he said. "I shall keep on fighting until my death but will not be intimidated," he said. Lalu Prasad also invoked world leaders like Nelson Mandela and Martin Luther King. "Had people like Nelson Mandela, Martin Luther King, Baba Saheb Ambedkar failed in their efforts, history would have treated them as villains. They still are villains for the biased, racist and casteist minds. No one should expect any different treatment," he said. The RJD leader said that "a Lie can travel half way around the world while Truth is putting on its shoes... But it still prevails...In the end though". "Truth can be made to appear as a lie, as ambiguous or a half lie by concerted onslaught of bias driven propaganda. But the blurred layer of bias and hatred will still be removed, come what may! In end Truth will win," Lalu added. Lalu Prasad is among 16 people who have been convicted in the fodder scam case.